8:00 PM pick up at your hotel in Hanoi. Transfer to train station. Take overnight train to Lao Cai. 8:30 Begin your Sapa tours by trekking to Lao Chai village where The H's Mong people live. Then continue your Sapa adventure to Ta Van village where the Dzay and red Dzao minority groups live in harmony together(total trek 13 km). Begin Sapa tour by trekking through bamboo forest to Giang Ta Chai village where the red Dzao group live. This path offers great scenery for all Vietnam package tours. Car pick up, back to Sapa. Afternoon, trekking to Cat Cat village offers beautiful photos. Visit black H Mong's cottage in so nice valley and waterfal, chat with local people. Discover their daily life. Overnight in Sapa. The second day of Sapa tours end. Arrive in Hanoi at 5:00 AM. Car pick up and transfer to your hotel. Now, your Sapa adventure ends. 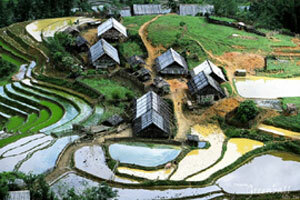 Join Sapa tours, one of the best for Vietnam package tours.